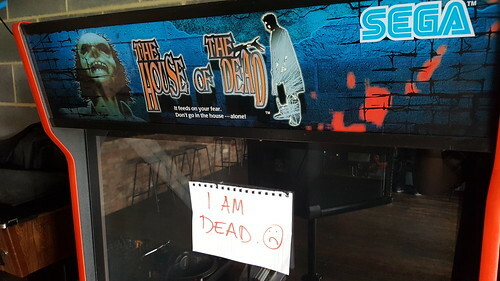 This cab was fully working, except for the monitor image rolling. 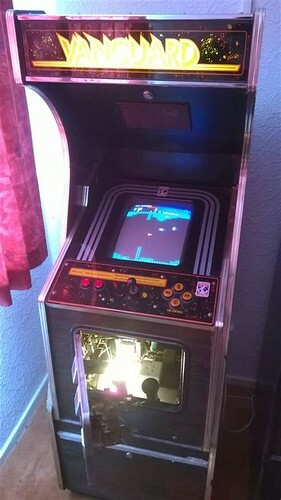 A tweak of the vertical hold pot on the chassis sorted this and I was able to play some Bomb Jack! Released by Tehkan (known today as Tecmo) in 1984 Bomb Jack is an awesome game, extremely fun and addictive. 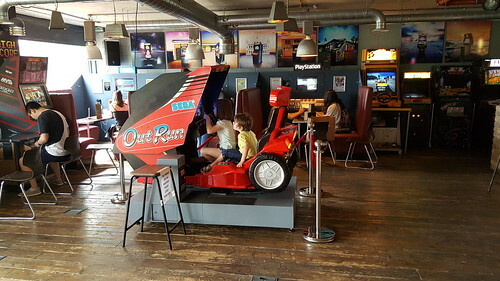 The premise is simple: collect all the red bombs, ideally in the correct order for the best score, whilst avoiding red-eyed homing birds and other adversaries. 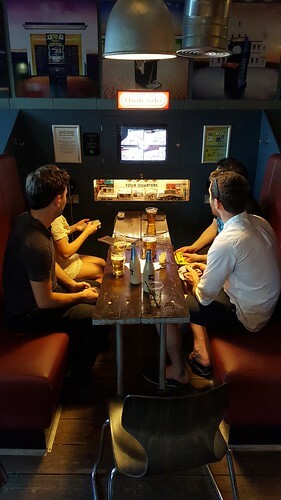 A local pub had a Chinese candy cab clone with a 60-In-1 multi game board installed, and me and my wife often played Bomb Jack on ‘date nights’, whilst listening to some tunes on the juke box and enjoying a few beers, good times! My wife is still getting higher scores than me though, which is a bit annoying! The monitor is 14”. 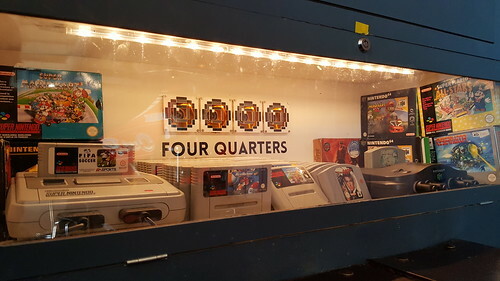 Unfortunately there is some burn, with some light Pac-Man maze image present. 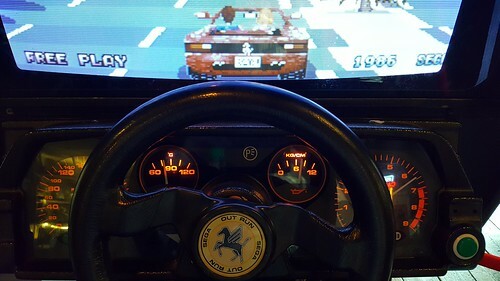 The front of the cab has hinges and can be tilted towards the player, allowing internal access. This is the first time I’ve seen this and is pretty cool. The internal light is also a nice feature. The coin count is very low and comes to a grand total of eleven pounds! 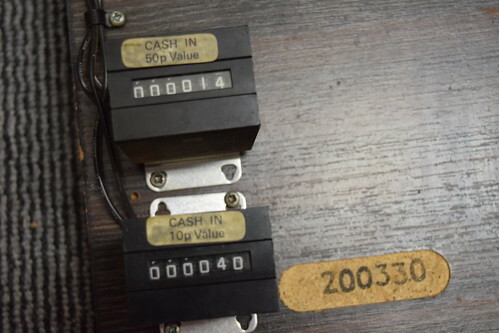 It looks like the cab had a Pac-Man type game installed originally, and the coin counters were probably replaced when the PCB was changed out. Old ten pence pieces still in the coin box. 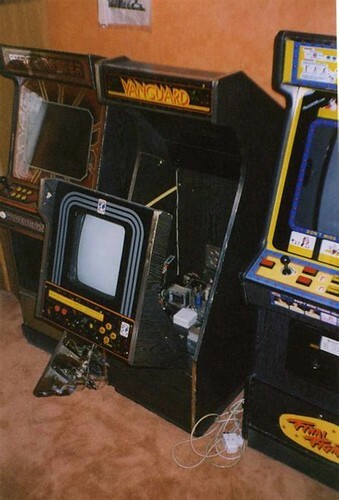 The cab had been sat in the former bar / games room for a long time, and was coated with years of grime and nicotine. After a couple of hours cleaning and polishing, the cab looks almost brand new. 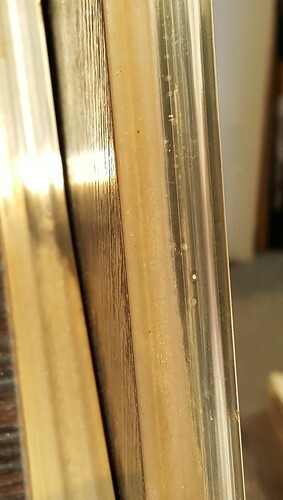 I used Mr Sheen multi surface wipes on the cabinet body, Wilko glass wipes on the monitor glass and baby wipes on the T-moulding. 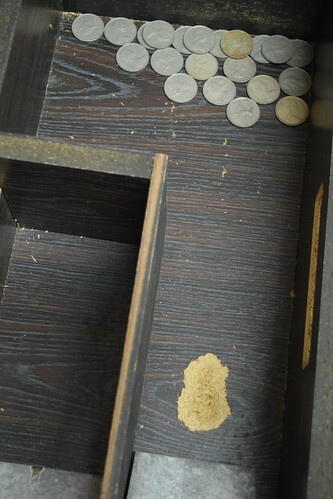 The pic shows the T-moulding partly cleaned to give you an idea how grimy it was. I also replaced the fluorescent tube, and I used Steller stainless steel cleaner on the marquee retainer brackets and fixings. This is great for removing surface rust and making parts shiny again. I’ve still got to have a clean inside and replace a damaged button. 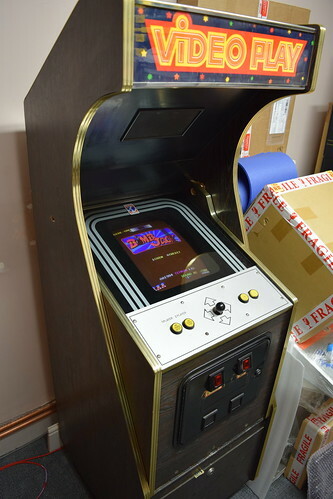 I find these quirky UK built cabinets really interesting, and so far I haven’t been able to find much information about this cab or the company who manufactured it. 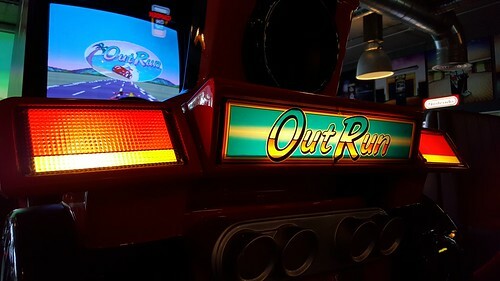 However I have found some pics of the same cab type, but with different artwork. 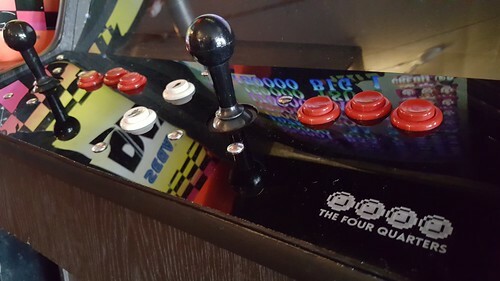 First up is this Puck Man cab. This appeared recently on Ebay. I really enjoyed cleaning this cab up and I'm pleased to add it to my collection. 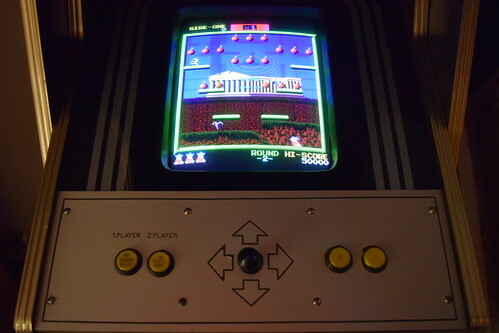 I'm now looking forward to finishing off my Donkey Kong and working on my next project, Astro Blaster! 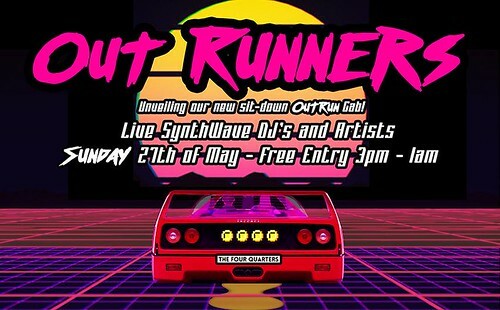 To celebrate the reveal of their new OutRun DLX cabinet, the venue put on a day of Synthwave / Retrowave / Outrun vibes. Despite being at work, the stars aligned and I was able to go along on a very sunny Sunday afternoon. Here is a walk round video. 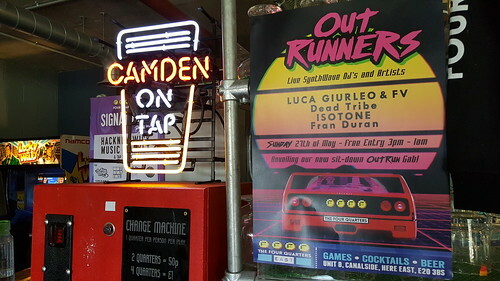 OutRun DLX proved to be a massive hit throughout the day. 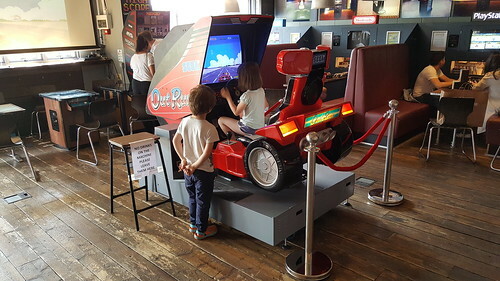 The cab was enjoyed by all age groups, from people who played the game back in the day to young children wowed by the machine. The cab played well, the monitor was great and the cab looked stunning. 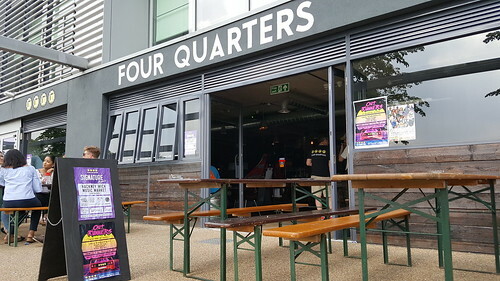 I had a chat with The Four Quarters about the history of the cab. It had been purchased from a Government repossession auction in Belfast, and was in a bit of a sad state when it arrived. There were mice nests inside and some of the 240V cabling had been chewed. 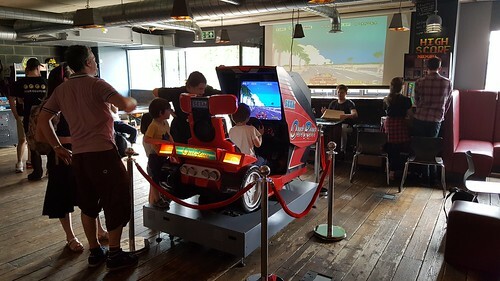 The game played blind and at some point the monitor had been replaced with a trisync. 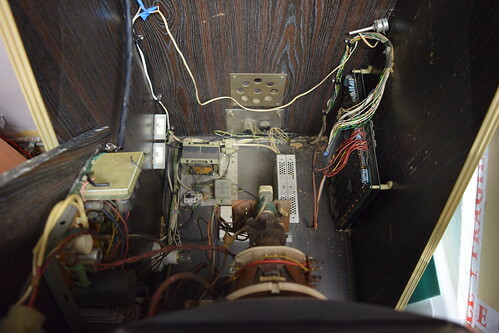 Restoration work took three months, and work undertaken includes monitor replacement, renewing the damaged cables and powder coating the base. The hard work has really paid off. 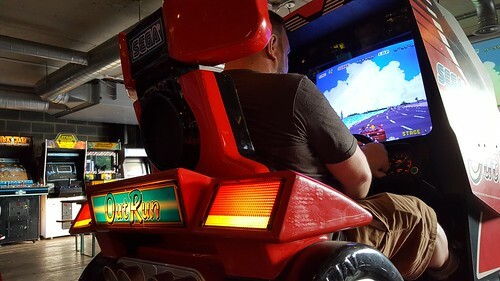 It’s amazing to see this awesome machine restored and back out there for people to enjoy. 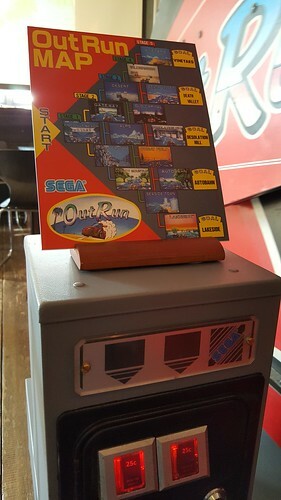 The course map on the coin tower was a nice touch. 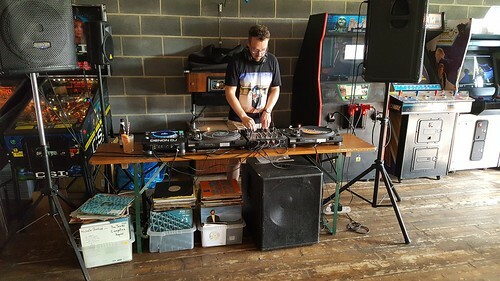 Music inspired by the game and the decade was played throughout the day. 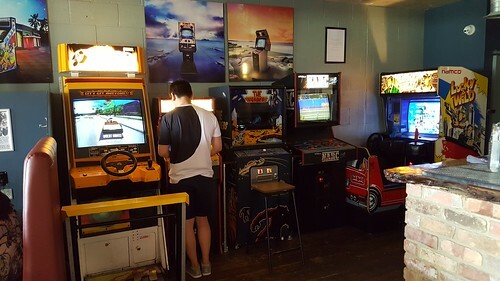 I also enjoyed a couple of credits on Cotton Boomerang, Crazy Taxi, Donkey Kong, Final Fight, Narc and Star Wars Trilogy. The irony didn’t go unnoticed. 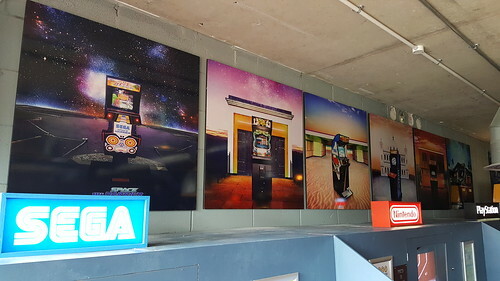 Passarella Death Squad’s “Fantasy Scenes” artwork on display. Some more pics from the day.